In light of the recent winter weather we’ve been experiencing here in Atlanta, we’ve decided to share one of our favorite spring/summertime scenes for our first “Scene Savoring” post… This view of a sweet little nook in Steve and Jill’s backyard is a favorite spot. It’s an extremely tranquil scene, and fills our hearts with some much-needed warmth during these cooler days. 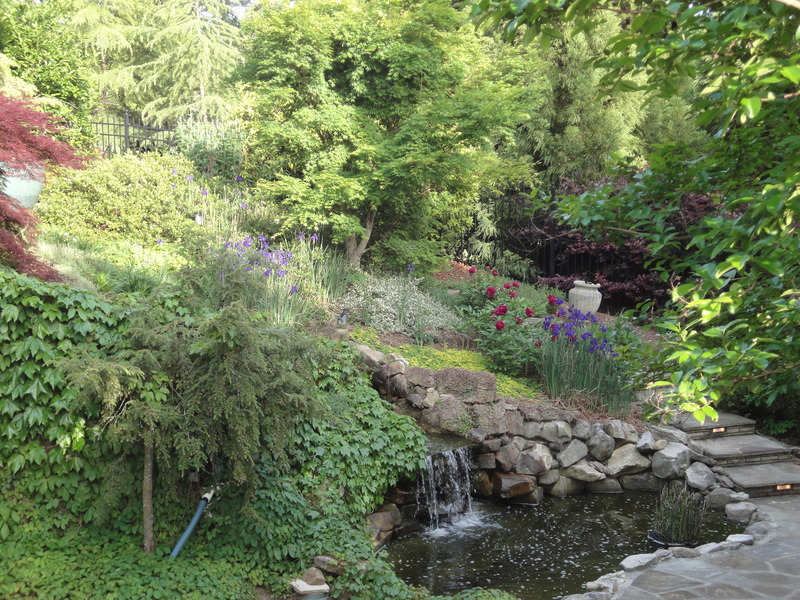 This Koi pond, set into the natural landscape is a source of serenity, and even inspiration. It’s a wonderful place to wander to when brainstorming ideas for steve mckenzie’s, or to get away from it all. Not to mention the presence of both peonies and iris, two of Jill’s most-loved flowers. In our “Scene Savoring” blog series, we’ll share images of scenes we find inspiring, motivating, or just plain fun! We hope to share a little about ourselves through these posts, and, hopefully inspire, motivate and entertain others. Enjoy! Previous We’re seeing RED… Give back by shopping!